Saving seeds is the first and last step of a good harvest. Home gardeners diligently tend their plots for flavorful produce, and prudent ones cultivate their seeds with the same dedication. Seed saving is the process of collecting seeds from successful plants, and then drying and storing them until it’s time to plant again. It is an ancient technique that is economical and beneficial for the environment. Seeds should be saved from open-pollinated heirloom plants because they will grow like their parent plant. Also, planting heirloom varieties encourages seed biodiversity and builds local resiliency. To get started saving seeds, try your hand with lettuce and tomatoes. These plants are great for beginners and will give you an introduction to both dry and wet seed processing. Plus, you’ll be two-thirds of the way to making the most delicious B.L.T. come harvest time. Saving lettuce seeds uses dry processing. Allow lettuce to bolt to seed. Small yellow flowers will grow on the stalk, with each flower made up of 10-25 florets. There is one lettuce seed inside each floret. Let the flowers (and seeds) dry on the plant. Once the seeds have dried, shake the plant into a paper bag to dislodge them from the residual chaff and flower fluff. Collect the seeds in a glass jar and store in a cool, dry place. 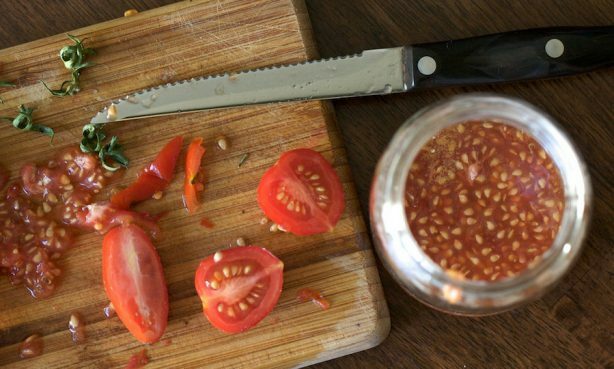 Saving tomato seeds uses wet processing. Cut open ripe tomatoes and remove seeds. Retain the juice and pulp around the seeds and set aside together in a container. Allow the seeds to sit in the juices for a few days. The pulp and seeds will ferment and dissolve the gooey encasement around each seed. Stir water into the container to wash the remaining pulp from the seeds. Remove any seeds that float to the surface. Collect the seeds from the bottom of the container and rinse in a strainer under running water. Dry the seeds by laying them out on a cookie sheet or screen. This entry was posted in Grow Your Own and tagged garden, gardening, seed, seed saving.